A concert is a live music performance in front of an audience. A recital is a concert by a soloist or small group which follows a program, such as featuring the works of a single composer (organ recital). A recitalist is a musician who gives frequent recitals. The invention of the solo piano recital has been attributed to Franz Liszt. The nature of a concert varies by musical genre, individual performers, and the venue. 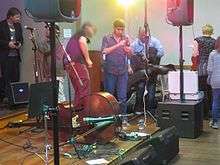 Concerts by a small jazz combo or small bluegrass band may have the same order of program, mood, and volume—but vary in music and dress. 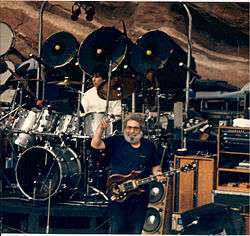 In a similar way, a particular musician, band, or genre of music might attract concert attendees with similar dress, hairstyle, and behavior. For example, concert goers in the 1960s often had long hair (sometimes in dread lock form), sandals and inexpensive clothing made of natural fibers. Regular attendees to a concert venue might also have a recognizable style that comprises that venue's scene. Other Types of concerts, To plan or arrange by mutual agreement. To adjust; settle. Some performers or groups put on very elaborate and expensive shows. To create a memorable and exciting atmosphere and increase the spectacle, performers frequently include additional entertainment devices. These can include elaborate stage lighting, electronic imagery via (IMAG) system and/or pre-recorded video, inflatable sets, artwork or other set pieces, various special effects such as theatrical smoke and fog and pyrotechnics, and unusual costumes or wardrobe. Some singers, especially popular music, augment concert sound with pre-recorded accompaniment, back-up dancers, and even broadcast vocal tracks of the singer's own voice. Activities during these concerts can include dancing, sing-alongs, and moshing. Performers known for including these elements in their performances include: Pink Floyd, The Flaming Lips, Cher, Alice Cooper, Iron Maiden, Daft Punk, Lady Gaga, Jean Michel Jarre, Sarah Brightman, KISS, Gwar, Slipknot (band), and Madonna. "Mini Tour" redirects here. For the David Bowie tour, see Mini Tour (David Bowie). A concert tour is a series of concerts by an artist or group of artists in different cities or locations. Often concert tours are named, to differentiate different tours by the same artist and associate a specific tour with a particular album or product (for example: Iron Maiden World Slavery Tour). Especially in the popular music world, such tours can become large-scale enterprises that last for several months or even years, are seen by hundreds of thousands or millions of people, and bring in millions of dollars (or the equivalent) in ticket revenues. While admission to some concerts is free, it is common practice to charge money for concerts by selling admission tickets. 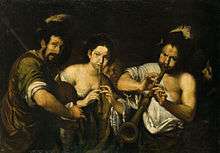 Historically, concerts were the primary source of revenue for musicians. Revenue from ticket sales typically goes to the performing artists, producers, venue, organizers and the brokers. In the case of benefit concerts, a portion of profits often go towards a charitable organization. 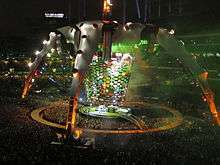 As of 2011, the highest-grossing concert tour of all time is U2 360 Tour, with gross revenues of $736,137,344. The second highest-grossing concert tour of all time is The Rolling Stones' A Bigger Bang Tour, which earned approximately $558 million between 2005 and 2007. Madonna's Sticky & Sweet Tour, which earned $408 million in 2008 and 2009 was the highest-earning tour by a female artist. It is unlikely that new acts will top these numbers. ↑ "How Franz Liszt Became The World's First Rock Star". October 22, 2011. Retrieved 17 January 2014. ↑ "What is a Concert Tour?". TourBeat. Retrieved 10 January 2015. 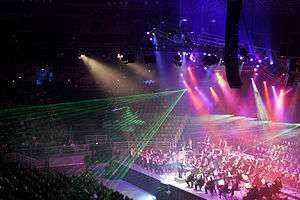 A concert tour is an opportunity for musicians to perform over longer periods of time across several cities, which are differentiated by segments known as "legs." Legs of tours of can be denoted by a series of dates that have no long break between them, by geographical regions or destinations, or by different opening acts. Each city or region may have the same opening act for each leg, or they may change opening acts at each city. ↑ Waddell, Ray (March 7, 2009). "Ticketonomics" (PDF). Billboard. ↑ Waddell, Ray (29 July 2011). "U2 Set to Wrap Biggest Concert Tour Ever". Billboard.com. Retrieved 31 July 2011. ↑ "Madonna Closes Tour In Tel Aviv;Second Highest Grossing Trek Of All Time". Billboard. September 2, 2009. Retrieved 2014-01-08. ↑ Johan, Jillian. "The Show Must Go On". aei. Retrieved 10 January 2015.